Continuing my exploration of local yarn stores while on vacation in Toronto, on our last day we stopped at Romni Wools. Two stories of floor-to-ceiling fiber (or “fibre” as they spell it in Canada). I don’t know how they keep track of inventory – that’s probably a job, all on its own. They also had the largest collection of books and magazines that I have ever seen in one place. You could spend days just perusing the magazines. The basement is full of “sale and discontinued” items – including a lot of large-spool yarn, which might be leftovers from factory production lines. Did not look like commercial yarn, and was not labeled like commercial yarn typically is. It is a tourist destination, all on its own. I only purchased a few items, but if I lived in Toronto, this would be a frequent stop. Spouse and I took a much-needed week and visited Toronto. It’s an amazing city – 4th largest in North America (from the airplane it seemed enormous)! The people are friendly and even the graffiti is artistic (probably by design – but even public wall art that did not look sanctioned was artistic and not vulgar). Lots to do, lots to see, lots of great food. Where ever I travel, I try to find a “Local Yarn Store” to visit, and I try to purchase locally-made yarn. I found two – Yarns Untangled in the hip Kensington District on Nassau Street and Romni Wools on Queen Street W. I also found a 3-story Michaels’ store, which was an adventure by itself, and had an enormous selection of yarn, but since that’s not a LYS, it doesn’t count. Yarns Untangled is a small local craft boutique, with a lovely (if small) selection of yarn. What was interesting about the yarn selection, is that you could find boutique yarn of the same dye lot in varying weights – a neat concept. The staff was extremely friendly, and there were four people sitting around a small table knitting and chatting when I visited. If you get the chance to visit Toronto, be sure you stop by – it’s worth the visit, and if you have a less-interested spouse, there is a terrific cantina next door, with a nice selection of beer. Had lunch with BFF B after a meeting in Indy last week. Was not in the mood to drive home, quite yet, so I asked if there was a LYS in the area. Out comes the trusty Google Maps, and we found Mass Ave Knit Shop about 10 minutes away. Contrary to the name, Mass Ave Knit Shop is not located on Mass Ave – though, I gather that the store first opened in that general location. The current location is on Virgina Ave in the Fountain Square district of Indianapolis. Lovely, spacious, store, with plenty of room for browsing, tables for knitting, and a classroom area off to the side. The yarn is organized by size and type, so it’s easy to find what you are looking for. The staff is friendly and helpful, and has a good understanding of the inventory. The yarns are good quality, and include both specialty yarns and Cascade yarns. 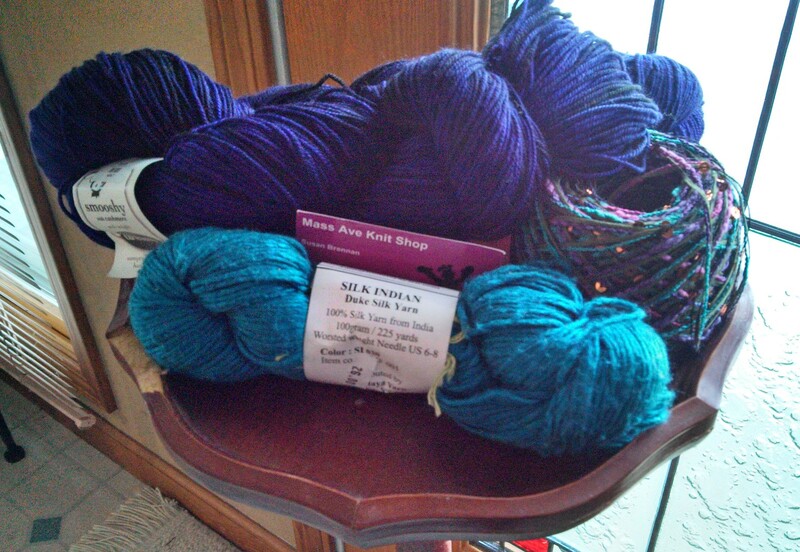 I picked up a few skeins – a turquoise silk and coordinating novelty yarn, and some dark purple and black sock yarn which might become stockings. B and I perused for an hour and thoroughly enjoyed the experience. Definitely, worth the visit. 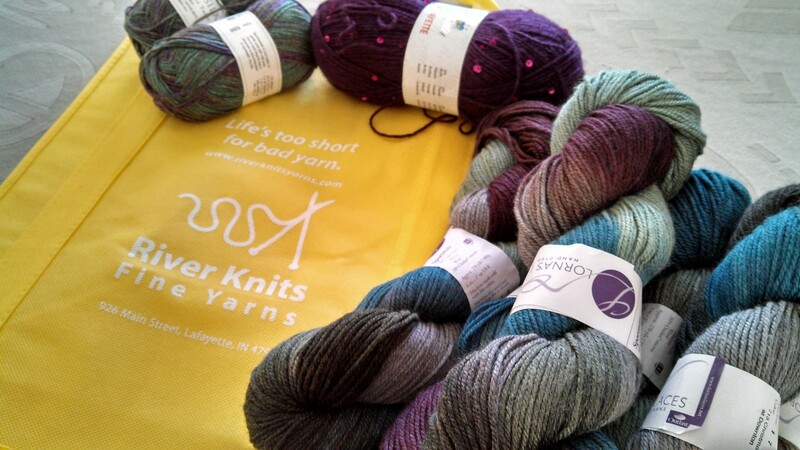 The stars and my schedule aligned for a visit to River Knits! I haven’t had a chance to visit in ages, and enjoyed the time perusing the store. It was a sunny afternoon, there was a class chatting amicably in back, and skeins and skeins of yarn to enjoy. Bonus – a RK shopping bag! Note the motto on the bag: Life’s too short for bad yarn!